I grew up in 1980s England and learned a lot about America from the films that I watched – on Betamax, of course – with my brothers and sisters, every weekend. Superman, The Goonies, Back to the Future, Home Alone, Grease – you get the idea. They all offered very exciting views of the USA and it really did seem like a world away from our quiet rural village in Hampshire. No joke: we had to travel 20 miles to get to a McDonald’s (it didn’t open in our nearest town until 1990) and our local cinema only had one screen, and was weeks behind the rest of the country. Weird and wonderful American myths/untruths were formed, until I finally got out there after meeting Mrs Life of Reilly in 2004! During my first trip out to the USA, I was constantly laughing to myself about the things that were true, false or completely new. Last year, American Scott Waters’ gave his honest and quirky views of the UK, which were so good because they were such normal and real things. So, here’s my lists of random things that I couldn’t believe were true about the USA, plus some observations which you might only know if you have friends or family out there. Steam coming up from a New York sewer when we were there – see, it’s not a special effect! 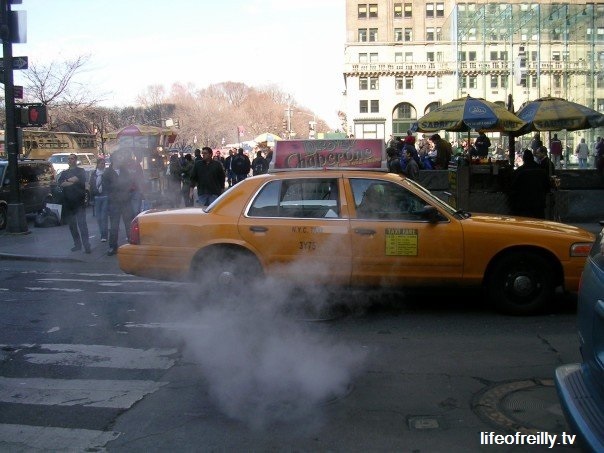 The smoky sewers you see in New York are completely real – not special effects by movie-makers. Portion sizes are big: True. But, it’s normal to only eat half and take the rest home for dinner the following night. Every restaurant is ready and willing to hand you a doggy bag. It’s only socially acceptable to do that in England at a pizza restaurant! A simple, great invention: you can clip the petrol pump handle at the petrol station so you don’t have to hold it the whole time when you’re filling up. It un-clips automatically when the tank’s full. I kind of remember this in the 80s, why did this option go in the UK?! Tailgating is a famous American past-time where sports fans eat and drink in the stadium car park before a game. It’s normal to rig up your own BBQ and big screen with satellite TV. Lots of ‘tailgaters’ don’t even have a ticket for the game but want to soak up the match-day atmosphere and feel part of the day more. 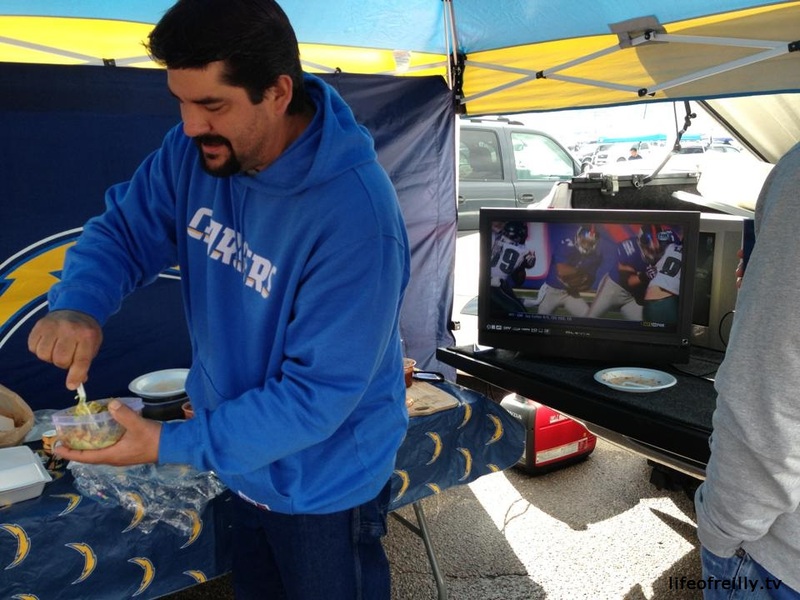 This was the Tailgating that I experienced at a Chargers v Raiders game, complete with BBQ and TV! Waiters and waitresses receive the minimum wage and rely on tips, so the UK average of 10% won’t cut it. Tipping has gone up from 15% to 20% in the last few years, so be ready for that. You’re also expected to tip your bartender at least a dollar a drink – even when they’ve just taken off the top off a bottle of beer and not even poured it!!!! There really IS a gap between the doors of public toilets. I thought this was something created for films so the characters could spy on each other easily. Toilet seat covers are available in pretty much every public toilet, so there’s no need to make your own germ barrier with toilet paper! This latest version in New York is on another level, though! Up until a few years ago, customers didn’t pack their own bags at the supermarket, someone would do it for you. Vons and Ralph’s, still have bag-packers. Most traditional radio stations only cater for one genre of music. Even then, they all seem to still play 80s and 90s music and random one hit wonders as part of their regular playlists still, too. There are now digital Sirius stations but you have to pay for them! You’re ALLOWED to turn right on a RED LIGHT, as long as you won’t cause a crash and there isn’t a sign which tells you that you can’t do it. Drive-through ATM cashpoints are a common sight in most cities. 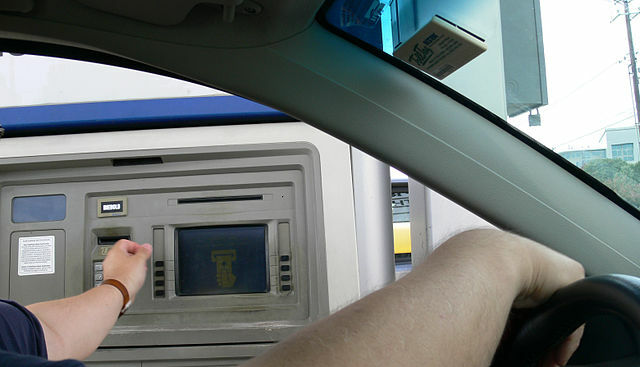 Drive-through ATM cashpoints can be found in most cities. Photo by Andreas Praefcke. Most normal people don’t live in houses the size of the McAllisters in Home Alone or Steve Martin in Father of the Bride. Just like the majority of English people don’t live in a quaint thatched roof cottage with a river running through their back garden. TV News outlets really do have helicopters – and a fleet of satellite trucks – for one city. There are several of these stations with all of these resources in each city, too! UNIVERSITY American Football matches regularly pull in crowds of up to 120,000 per game – that’s the size of Wembley and White Hart Lane combined…for university sport! The average crowd for a normal student match in the UK is probably minus-five because the substitutes have gone off to the pub. 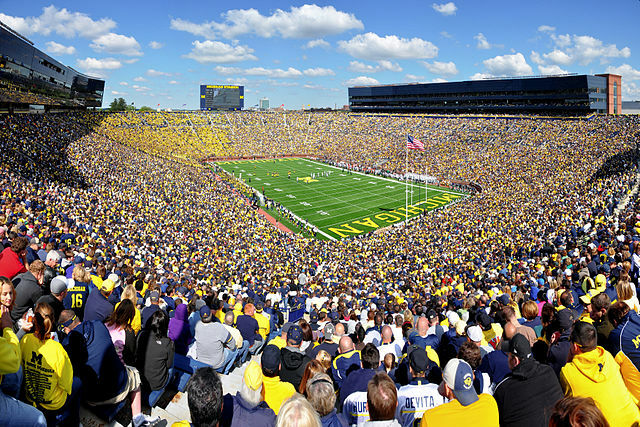 University American Football game Michigan vs Eastern Michigan which was watched by 110,000 people…110,000 for a UNIVERSITY match! Photo by Andrew Horne. University sport (sorry, get your American accent ready, “College Sports”) are also featured LIVE on major sports channels – even the finals of the kids’ Little League baseball series! It’s very weird watching children playing a sport on ESPN. Football (soccer) actually does seem to be getting bigger in the States. Most kids play it when they’re growing up, instead of baseball and there’s now more English football on TV so the next generation will probably have a Premier League team that they support. Postmen drop off AND pick up mail from the box at the front of your house. So, there’s no need to walk to the other end of your village or drive to your local supermarket to send that annoying free-post letter you didn’t want to send in the first place! 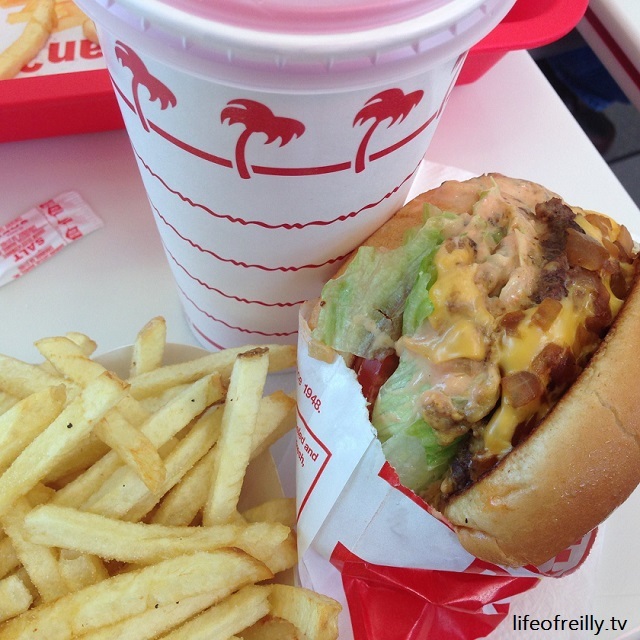 In-N-Out Burger is only available in five States (California, Nevada, Arizona, Utah & Texas), so if you see one, you should probably give it a try! It also has a secret menu which has the best combinations, so make sure you come back here to find the link, before you order. The Cheesecake Factory doesn’t just serve cheesecake. In fact, it’s a restaurant first and then a dessert place second. The cheesecake is the highlight though, unsurprisingly. When watching an American TV show…you know those points where a dramatic moment is repeated in the British version? This is when there would be adverts on in the States. They also usually have commercials before the end titles so they can avoid a break between two shows. Adverts are more frequent, too. There are random town/road names which keep popping up big cities: Who or what is Lafayette and Sepulveda?! Some American towns really like the idea of bringing in roundabouts but they over-explain the signs and make it really confusing – even when you know how a roundabout works!! Ever seen a more confusing roundabout since the Arc de Triomphe? 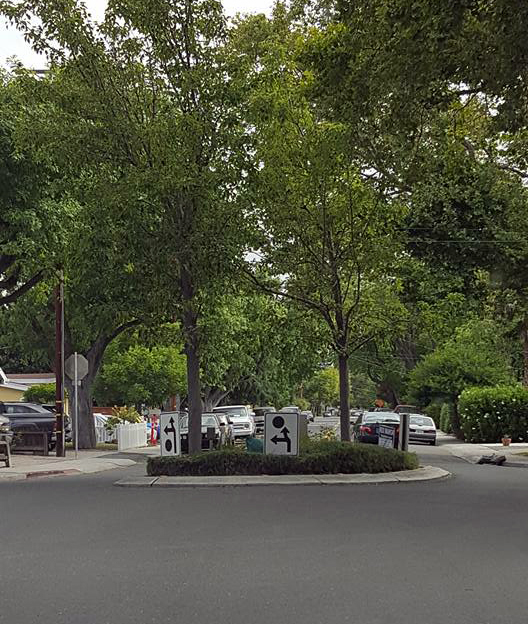 Photo taken in Mountain View, Northern California by Danielle Reich. In built-up areas, it’s quite normal to not know when one town ends and another begins . The best tip that I can offer is wait until you see another IKEA, Wal-Mart or Target. Shopping mall car parks are FREE! It makes sense to not have to pay to park for the cinema or to exchange an item!! In big towns and cities, every STREET has its own exit from the freeway, usually every quarter of a mile. Definitely NOT the average 5-10 miles in between junctions that we have in the UK. Many towns and cities have numbered streets, and also road names which are in alphabetical order, eg: Apple Street, Bacon Street, Cheddar Street. Pretty handy when you’re trying to work out where a certain road is. 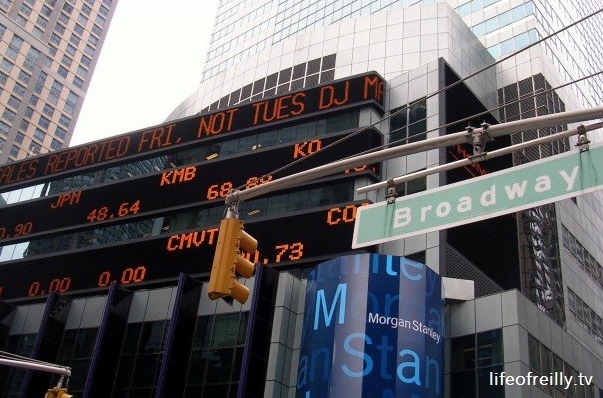 Broadway in New York City. Tax is added on AT the cash register, so when you get your $1 out to pay for a 99c item they’ll ask you for $1.07 or whatever the tax is in that State. Oregon is the only state with 0% sales tax – sounds like a good place to pop into for the day to buy an iPhone – or at least have the satisfaction of paying $1 for a $1 product! The coins are really tough to read and work out – there aren’t many numbers so you have to know how much a dime or a nickel is! Also, the smaller coins are sometimes worth more than the bigger ones! Pushchairs and buggies are called “strollers.” People won’t understand what you’re talking about if you use the English names, unless they work at an airport. You really DO get free soft drink (soda) refills at most restaurants, and bottomless filter coffee at cafes/diners. 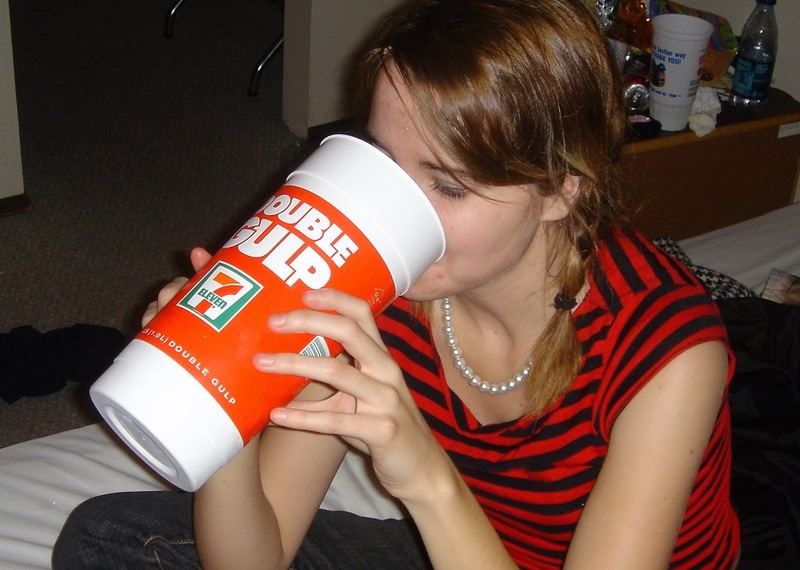 Big Gulps really exist and you can buy one which looks more like a bucket than a cup! Mexican food is a staple. It’s more popular than curry out here. (Oh, and it’s tough to find a good curry in the States). Americans cut up their food with a knife. Then, put it down and eat everything with a fork in their right hand. There’s no dual knife and fork action, something which is considered good manners in the UK. Most fridges have double doors AND an ice and water dispenser plumbed into the mains. Garbage disposal units are commonplace. Why have they not caught on as much over here? They’re a great way to get rid of leftovers. There are still some really old cars on the road still, mainly because the Smog Test doesn’t check many things that would make a car fail an MOT, here. 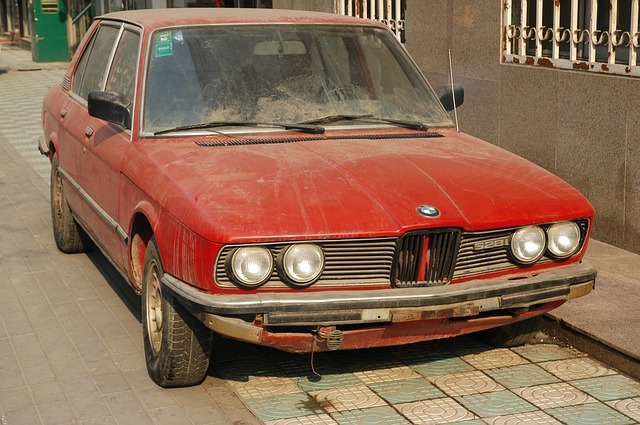 You’re likely to see some pretty old cars out on the roads still. The majority of people are very proud of their political allegiance and will speak about it openly. It’s a very British tradition to be offered a cup of tea – or other drink – as soon as you walk into someone’s house. Don’t expect this in America. In fact, providing guests with a drink is not at the top of the list of priorities when you arrive at most peoples’ houses, unless it’s a party. When you first land, it can feel like you’re being sold something everywhere you look: on TV, radio, big billboards, park benches, man on the corner spinning a sign, even the stats on a sports report are sponsored. Ironically, NO sports teams wear a sponsor on their shirts while they play!!! 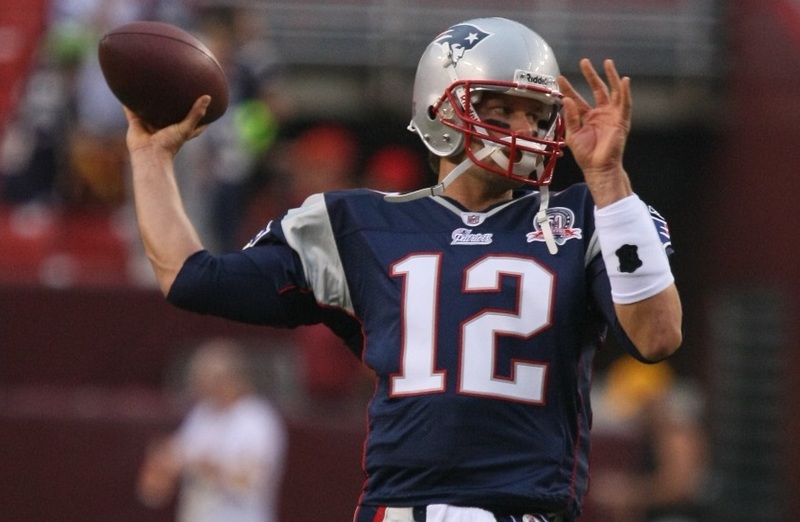 There are no sponsors on any professional sports teams in the USA. Photo by Keith Allison. People aren’t afraid to go out to the shops not looking their best. Lots of women go out in their running clothes (activewear) or ‘sweats.’ I’ve seen lots of men go to the shops or walk their dog in what was definitely their pyjamas. Why are us Brits so vain?! It’s actually illegal to cross the road anywhere but at traffic lights, even if there are no cars around. It’s called J-walking. New Yorkers are the only members of a city who really laugh in the face of this law. “Ped X-ing” written on the road means Pedestrian Crossing. Maybe I’m just thick, but I still say “Ped X” in my head when I see the sign! Weirdly, road markings are the other way around. 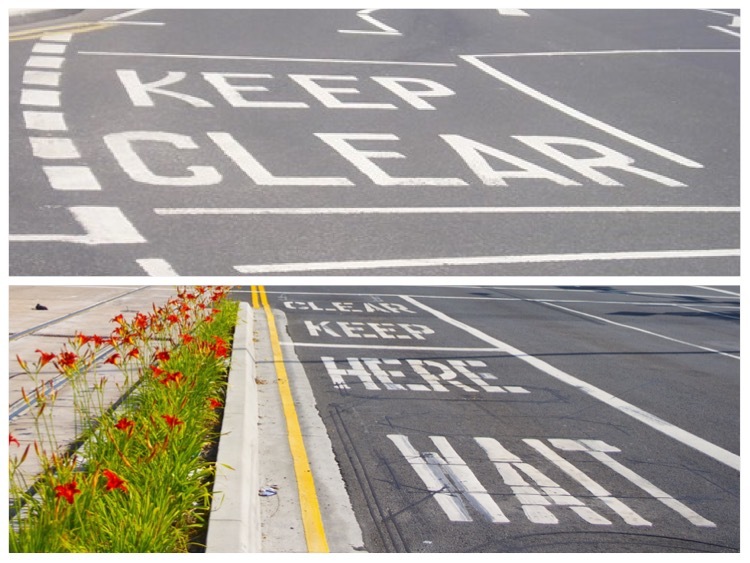 In the UK, you’d see KEEP CLEAR on the road but in the States it would be CLEAR KEEP – depending on how you’re used to reading the markings, of course. Yoda would love it! The famous American LIGHT beers really do taste of water. But American CRAFT Beer is very strong!! It’s full of flavour and rising in popularity every year. I think it’s better than most European beers, now! Americans don’t mind mixing sweet and savoury, especially at breakfast. You’ll get sausage, egg and pancakes on the same plate, and many people will drizzle maple syrup all over the sausages and bacon, too!! People actually LIKE to make small talk and get to know strangers, even if they’ll never meet again. Can you think of anything more un-British?! What random observations have we missed? Did you think there were THIS MANY small differences? Leave your thoughts in the comments section below.